Ironically, the last time I was in Four Corners, I was also meeting Kate: that was 11 months ago, when I made my (until now one-and-only) visit to write it up for the Coffee Spot. This neatly sums up a dilemma that has come with writing the Coffee Spot. I’ve touched upon this before, but the essence is this; there is always the pressure to try somewhere new, particularly when travelling up to London, where more coffee shops open each week than I can possibly cover. As a consequence, I don’t get the time to visit old favourites, such as Four Corners. And make no mistake, even though I haven’t been there for 11 months, Four Corners is still one of my top Coffee Spots in London. There’s a special atmosphere about the place, a friendliness combined with an off-the-wall quirkiness, which really appeals to me. 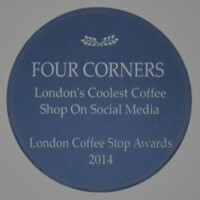 I was so pleased when Four Corners won the inaugural Coffee Stop Award for “Best Use of Social Media”; it was thoroughly well-deserved. Anyway, enough of my complaining. What did I actually find when I got back to Four Corners? Well, as I’ve said, it hasn’t actually changed much. There’s still the same warm welcome and off-the-wall humour and the layout’s basically unchanged. The cake and pastry selection remain excellent, while the lunch options have definitely expanded. The opening hours have also been extended into the evening. I managed to work my way through more of the coffee menu, this time trying a latte and following that up with a decaf cappuccino just for variety, both of which were excellent (with beans from London’s Ozone). Kate had an iced latte, which came, to her great delight, in a little milk bottle, while I finally got to eat one of the famed pastries from nearby Balthazar Bakery. The other difference was that there seemed to be even more loose-leaf teas from Yumchaa. It was one of the things I remember from my first visit, when the owner, Gary, explained that he wasn’t doing pour-over filter coffee, instead using the space to do proper tea and to do it well. I was impressed by this commitment to coffee’s often-overlooked counterpart and am pleased to see that the tea side of the business continues to thrive! Don’t forget the original Four Corners Coffee Spot, which includes the complete write-up and an updated gallery. This entry was posted in Cafes, Cake, Coffee Spot Updates, Evening Opening, Laptop Friendly, Lunch, Sandwiches, South East London and tagged Ozone by Brian Williams. Bookmark the permalink.